We're still fighting the reflux, and he can be rather unhappy when it hits, but we're seeing some strategy pay off. Although we're about to switch from Prilosec to Prevacid, as the two drugs use a different way of activating the same mechanism (turning down the volume on production of acid at the protein pump level). 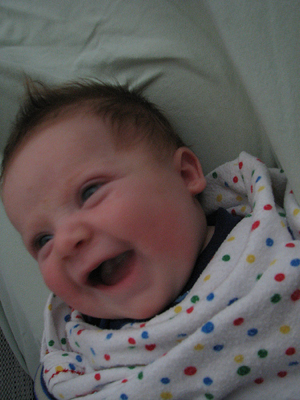 In any case, we're seeing more smiles at times, and he slept a crazy long 10 1/2 hours last night. This is a photo Lynn took earlier this day; things went south after this, but it was a nice happy time.